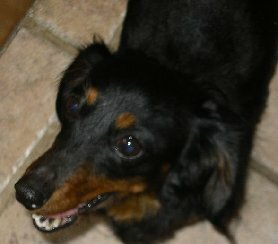 I'm a computational physicist with a weakness for weiner dogs and a strong interest in astronomy, geology, and the history of the Second World War, particularly the Pacific Theater. And so, from the depths of my heart, I offer: The Pacific War Online Encyclopedia! The Encyclopedia is really the main reason for the existence of this web site. Kent and Bruce's Excellent Adventure: A trip to Yellowstone with a paleontologist friend. Kent and Bruce Have Another Excellent Adventure. A trip to the Jemez and Raton. Geology of the Jemez Region. My notes on my numerous rockhounding trips in the vicinity of Los Alamos, which I am turning into a book. Still under construction. Wanderlusting. Some road trips looking at local geology. Updated from time to time. Debunkers.org: A nice forum for discussing junk science, though the discussion tends to wander into junk politics, junk journalism, and ... well, heck, anything likely the raise the blood pressure of anyone who does not suffer fools gladly. The rooks must be on opposite sides of the king. This implies that the king cannot be set up in the a or h files. The bishops must be on different colors. To get a new setup, simply refresh this page. I can be contacted at trollingshallows@msn.com. Boasting about one's nerdiness is the surest sign that one is a serious nerd.